Broth made from rehydrated cubes is different in taste from fresh broth because of its higher salt content and flavours changed by the boiling process. Bouillon cubes are convenient and inexpensive but have little nutritive value. The cubes are widely used in English cooking to add flavour, particularly in soups, stews and casseroles. They often contain flavour enhancer either yeast extract or monosodium glutamate from other sources. Today, I have warm comfy soup. Here in Texas we had hot and dry summer, so I was looking forward to the cool winter. Not sure what is going on with winter this year. Mother nature didn't get the memo that this is the middle of winter and this should be the coldest month. We are experiencing spring like weather here in Texas. Today, 78 degrees. Tomorrow, 85 degrees. It's hard to believe that it's February and we have spring like weather. That's Texas for ya. We always say if you don't like the weather here in Texas stick around, because the weather will change as fast as you can blink your eye. In dutch oven, heat oil over medium heat. Add ground beef, salt, pepper and Worcestershire sauce. Breaking meat up, cook until no longer pink. Add onions, carrots and celery. Stir well. Add beer, water, beef bouillon cubes, garlic, paprika, bay leaves, sugar and potatoes. Stir well. Bring to boil. Reduce heat, cover, simmer for 20 minutes. Ladle out 1 cup of hot liquid, pour gravy mix into broth. Whisk gravy until completely dissolved. Pour gravy back into the pot. Stir, cook another 15 to 20 minutes, until potatoes are tender. Enjoy! Your soup looks so hearty and comforting, especially the the beer added to it. At least you are having nice weather. I thought that the weather saying was for Chicago, "If you don't like the weather , wait five minutes, and it will change, and that's the truth! This sounds really good, what could be replaced for the beer? I do not drink and do not cook with alcohol either. You can replace the beer with a cup of water. Alcohol cooks out and leaves just the flavor. I like cooking with beer as it is a great tenderizer and as well it adds a hearty, beefy flavor to whatever you use it in. I never used bouillon before until just recently and I was so shocked about the flavor it added to the dish. I had no idea. I am definitely going to start incorporating them more and more. Great soup recipe! My mom used to make a soup with hamburger when I was growing up. I don't think she used beer. This sounds really good. Wow! 80 degrees in winter?!?! Can't complain here, though, as the weather in NYC has been unseasonably warm and comfortable. I'm big on soups during the colder months and yours looks warm and comforting. Thanks for sharing! Oh dear, that's too hot for my February! I think that this warm and filling soup is perfect for an Alaskan winter, though. My family would love this one! Thanks, Christine! Hamburger and beer in a soup, just two of my favorite things, awesome idea! Comfort food comes to mind. Beer - that's different! oh beer, i wonder what it taste like. I have never used beer into soup but sure your recipe is tempting me to try one. Nice for the cold and rainy weather we have here from time to time. Thanks to all for all the amazing comments. Just love hearing from you. beer in soup? sounds awesome! Hi Sonia, I'm glad you enjoy my site and recipes. Just under the recipe, next to the share buttons there's a 'print button.' Thank you! Many of my kids are now busy with their own little families, and soccer, and homework etc. 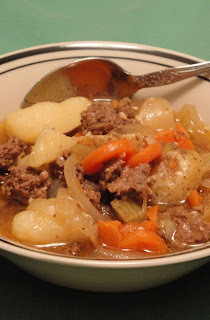 This makes for a great hearty home cooked dinner for those crazy busy weekday frenzies! love this recipe. Great for a cool fall evening! This sounds like the perfect dinner for the chilly nights we're having right now... I just love chunky soups!